Here are photos showing how the brush looked before being used. The second photo shows how it looked after being used a few times. Last edited by brothers on Thu Oct 04, 2018 9:07 pm, edited 2 times in total. This is very disappointing. Have you informed Bob Quinn about the problem? I think he should refinish the handle for you with CA for no charge and cover the shipping costs both ways. I'm looking at it as another woodworking/craft project for me to engage and enjoy. I take the blame for an erroneous assumption on my part. brothers wrote: I'm looking at it as another woodworking/craft project for me to engage and enjoy. I take the blame for an erroneous assumption on my part. I think you're being unnecessarily hard on yourself. I don't believe it's too much to assume that a wood item that is to be exposed to water would be finished in a manner befitting its use, be it CA or some other water resistant material, which your handle was evidently not. Good point Bryan, however, I have always been looking for an excuse to learn how to properly apply the CA finish, and this is my golden opportunity to do so. I see this as a positive step forward. The handle was difficult to find, and when I saw it, I had to have it. Now that I've inserted the excellent Shave Revolution synthetic knot and the brush as a whole is great, I'm just looking forward to making it as perfect overall as I can. Maybe it'll be an heirloom when my shaving days eventually become a thing of the past. Last edited by brothers on Thu Oct 04, 2018 9:00 pm, edited 34 times in total. This is the mesquite burl handle with all of the original finish removed, and ready for refinishing. Last edited by brothers on Thu Oct 04, 2018 8:40 pm, edited 2 times in total. Project complete! Here are the photos showing 9 coats of CA (superglue). Planning what to do, how to do it, and gathering the necessary materials took up most of the time. Today, going slowly and making sure I did everything in the correct sequence without making stupid mistakes only took about 3 hours from start to finish. What a feeling of relief! Last edited by brothers on Thu Oct 04, 2018 8:56 pm, edited 2 times in total. That's a gorgeous brush Gary. Use it in good health. That's about the most beautiful burl handle I have ever seen. Like you wanted, now it's perfect! Great job, Gary. This is an update. I'm in the process of replacing the Shave Revolution synthetic knot with a new and improved one. The blue tape is durable and protects against damaging the beautiful CA finish during the vigorous and prolonged use of power tools to remove all of the vestiges of the old knot that is destroyed in the process. Gary, what knot did you use to replace the synth? Also, I would love to know more about your process. I have considered a Mesquite burl from Bob but am wondering now if I will go through with it. I love that handle shape and the look it has with CA. I was pondering a Manchurian. anyway, I wouldn't mind details, either in the thread or via PM. Tim, knowing what we currently know, I'd certainly ask the maker of the handle to consider a finish that doesn't disappear after only a few weeks of use in wet soapy conditions as mine did. 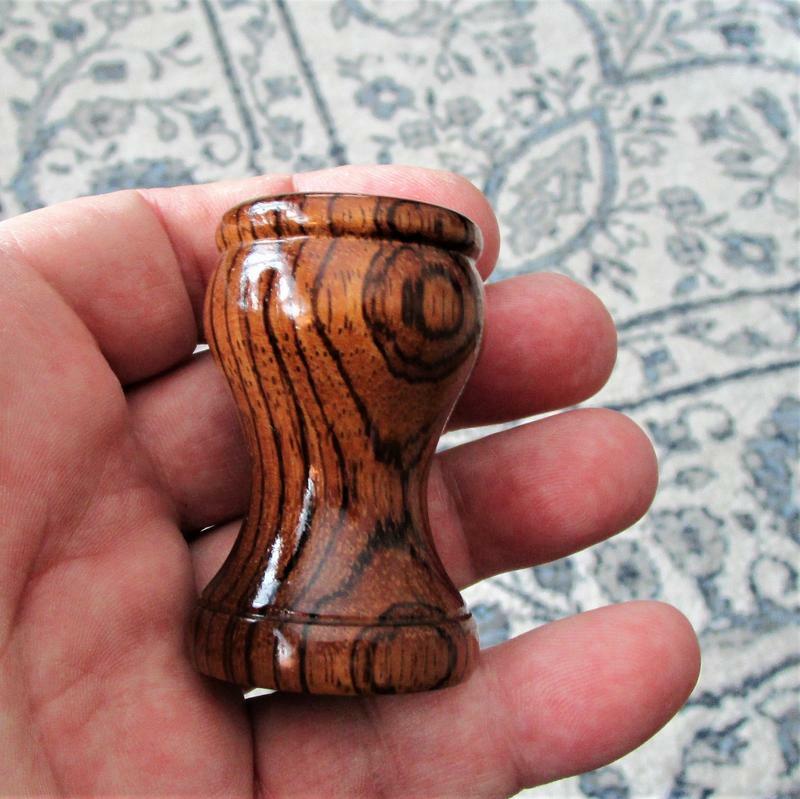 I presume a woodworker making and selling expensive handles has wood-turning and airbrushing equipment and experience that would have made my project completely unnecessary. I have neither the equipment nor the training that applying a properly durable and beautiful cyanoacrylic finish would entail, and as a result I had to improvise with extensive pre-planning and care. Thank goodness it was successful. The replacement brush head is called SynBad. I bought it from apshaveco.com. The only equipment I had was a variable speed (very slow speed turning) electric drill and a bench vise. Rube Goldberg would have been proud of my contraption. Since I do not own a lathe (required to apply the finish to the spinning handle), I had to invent a way to have the drill holding onto the handle and turning it very slowly in mid-air while I applied the liquid CA onto the turning handle with small squares of paper shop towels. It dries in about 2 seconds. Breathing apparatus (I had a professional facemask that I have used in the past while painting cars) is mandatory as are a boxful of suitable rubber gloves. That stuff including the molecules floating in the air as it is applied and as it dries will literally kill our lungs, eyes, and noses, and glue our hands and fingers (and rubber gloves) to whatever they might touch. I had to buy the CA and the Accelerator on Amazon. I found a gold mine of information on YouTube, specifically several posts of Cap'n Eddie Castelin, a woodturning lathe master craftsman from Louisiana. I think he may be deceased, but his wisdom is available. I watched the ones about finishing with CA a number of times and made some good notes on what to do and what to avoid. In my mind I'm not sure about wood and water but having been messing with some wood handles lately. If figure if wood was good in water they'd make boats out of it (poor joke). Here's a piece of zebra wood. I took a little liberty with the color, the number of coats of tung oil is absurd. I plan on putting a mixed knot in this handle. Your handle looks great. Mine still needs a good buffing yet. Oscar, that is beautiful. If you ever decide you're open to making handles for sale again, I'll take one identical to it. The shape is absolutely perfect. Oscar that's a beautiful handle!